The music for The Last Jedi is being recorded much earlier in the process than for previous Star Wars movies. On the first six films, the music was typically recorded around two months prior to the film's release. Due to a last minute change in composer, the music for Rogue One was scored relatively late in the process with composer Michael Giacchino only having four weeks to write the score. 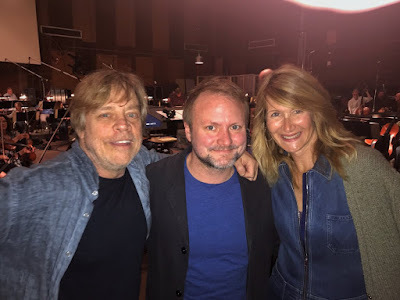 On The Force Awakens, Williams' last Star Wars soundtrack before The Last Jedi, scoring sessions began in June 2015 and continued periodically all the way through November. This suggests that these early scoring sessions are merely part of the typical process for a John Williams composed Star Wars soundtrack these days, and nothing out of the ordinary. It's also cool to see Laura Dern around Star Wars, given that so little is known about her role in the new film. She was announced as a cast member back in February 2016, but since then there has been nothing revealed about her character. The secrecy surrounding her role is so intense, the actress revealed a few months ago that she won't even tell her kids who she's playing. Star Wars: Episode VIII The Last Jedi hits theaters on December 15th. The film is written and directed by Rian Johnson and stars Daisy Ridley, Mark Hamill, John Boyega, Adam Driver, Carrie Fisher, Kelly Marie Tran, Laura, Benicio Del Toro, and Lupita Nyong'o.